If it’s Thursday it must be Manchester so Friday will be Chester. Just a small section of the Caravan and Motorhome Club stand. 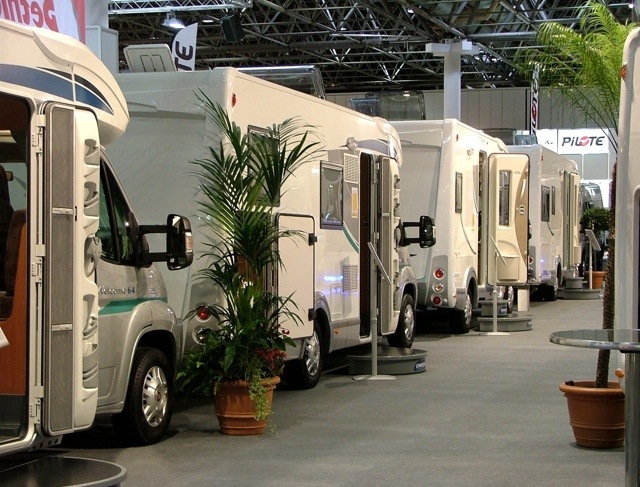 The Caravan and Motorhome 2018 Show is on at the moment at Event City in Manchester. I attended the opening day on Thursday and it looked well attended to me. The organisers are probably hoping that 20,000 people will visit and if the people traffic on the Caravan and Motorhome Club stand are anything to go by it would not surprise me if that target is met. The cold weather does not help but offsetting that is the enormous population in and around Liverpool and Manchester which provides the bulk of the visitors. One delightfully “British” thing happened to me. I dutifully followed the visitor parking signs in my motorhome and in due course arrived at this huge space sandwiched between the Event City exhibition centre and Trafford Park retail outlet. As I got to the front of the queue a man wearing a high viz jacket emblazoned with the parking contractor’s name approached me waving his arms. “You can’t bring that thing in here!” he announced sternly. “But it’s a motorhome show!” I protested. He was having none of it and I couldn’t help but note the difference in attitude in Manchester to that at the Dusseldorf Show. Sometimes I despair!! Later that day in the early evening I drove along the motorway to Chester in sleet and light snow. The wardens at the CAMC Chester Fairoaks site were still in the office at 7.30pm together with their delightful cat – even the cat provided a much more welcoming experience than had the parking attendant earlier. My AutoSleeper Malvern took its customary eight minutes to set up and in no time at all a glass of wine had been poured, supper was cooking and I was on WiFi via my annual subscription which I can cart from site to site. The Dusseldorf Show. Simply the Best. Time spent at the Dusseldorf show is time well spent I reckon. Many new products were launched – but this concept e.home from Dethleff caught my eye. Covered in photovoltaic cells (solar panels to you and I) it also had its own dedicated Alexa which arpart from her other well known capabilities controlled all the main functions. Even changing a frosted glass door panel into a full length mirror…. 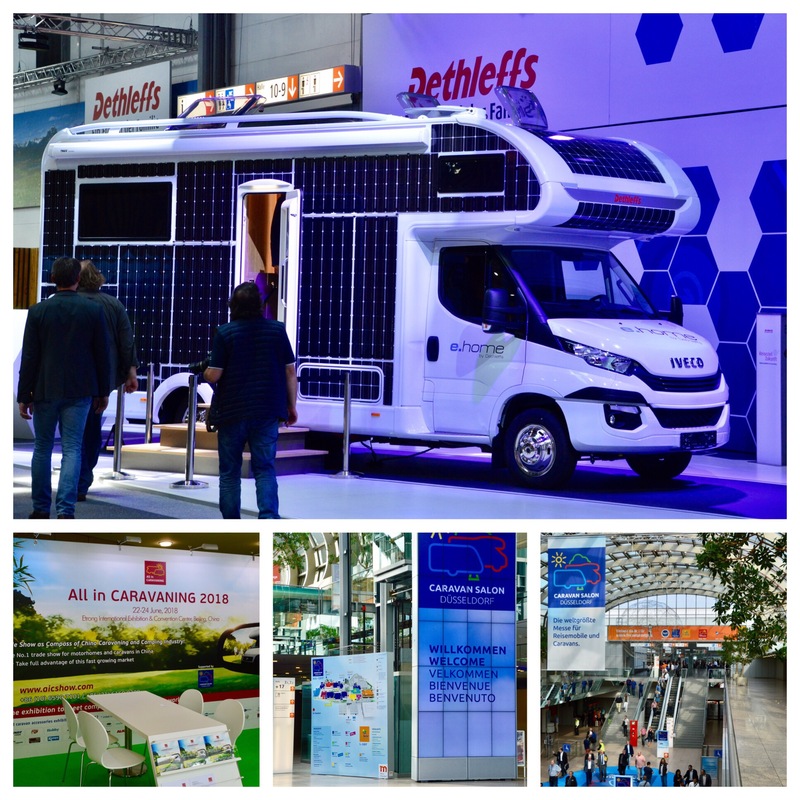 “All in Caravanning 2018” is an industry wide initiative to attract a new audience – much like the Discover initiative we have in the UK. 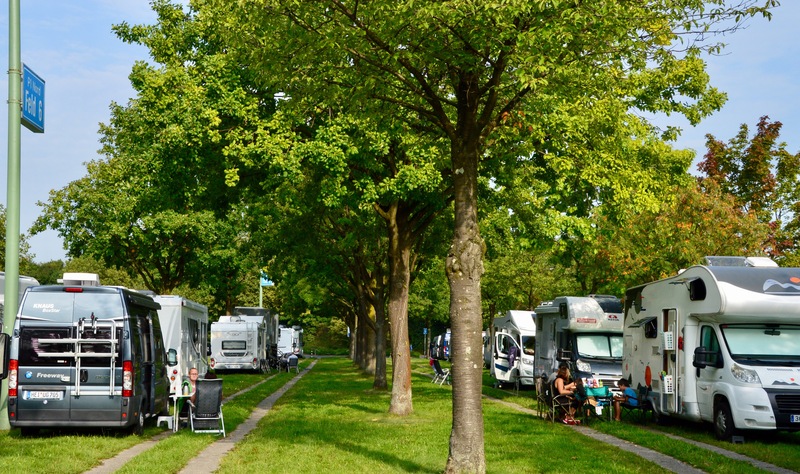 Three or four thousand motorhomes and caravans pitch up in the grounds and it is a thoroughly social occasion with beer tents, food stalls and live music and good facilities for those who prefer them. The exhibition area with its giant halls is under the Dusseldorf airport main flight path so you wouldn’t book here for a few quiet days away from it all. I know that nearly all followers of this blog themselves travel extensively and see different standards of pitching and site administration in their travels. This is a slick and fast pitching operation which it needs to be but cautious spacing is not on the agenda. 1. The number of van conversions on view has reached bewildering levels. 2. 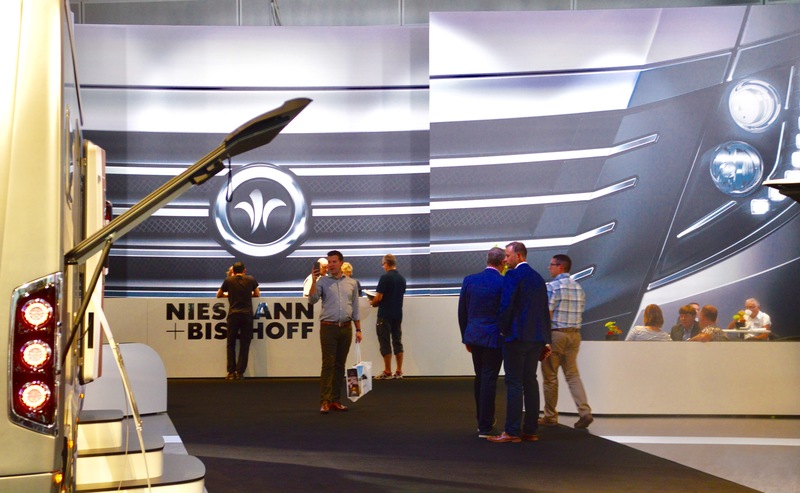 The show has a large number of bespoke vast military pedigree four wheel drive motorhomes which are far removed from the very welcome appearance of the new Fiat Ducato four wheel drive variant. Also, the show features F1 style motorhomes many of which keep a top of the range BMW Mini is the garage. 3. I noticed that more and more manufacturers this year were adopting the marketing policy of separate stands for separate product groups. 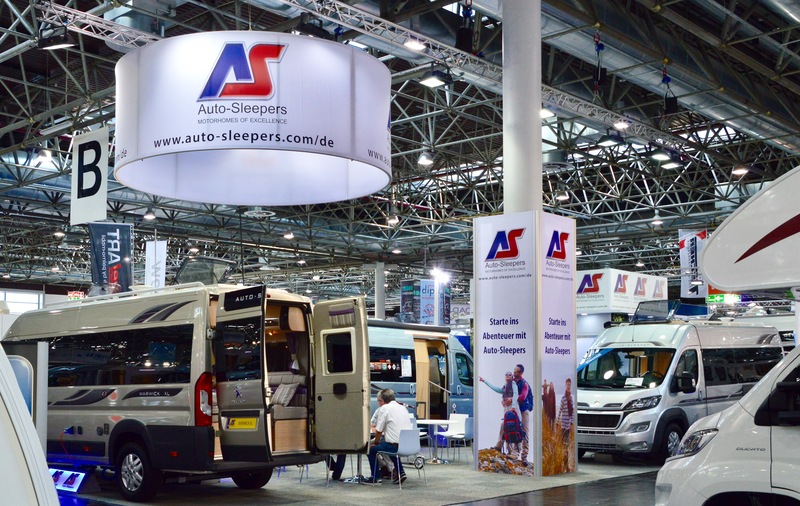 So van conversions would be in one place and motorhomes in another completely different part of the show in order that potential customers can easily focus on what they want. It is not new thinking – just more of it. 4. On motorhomes, minimalist white interiors are the order of the day. Out with the wood effect…. 5. One of my grandchildren thinks it incredibly cool that there is a Dexter van conversion – obviously named after him he feels!! For much fuller video coverage by the talented journalist Andrew J Ditton do click HERE or enter this next link if clicking freaks out your computer. Andrew is producing a series of video blogs from Dusseldorf of which this is the first; his manager Dougal puts in the occasional appearance much like Alfred Hitchcock did in his films. It truly is an enormous and stunningly informative show. Last time I went I hooked it up to a few days holiday in Germany which is a good use of time but this time it had to be a there and back affair. None the worse for that. 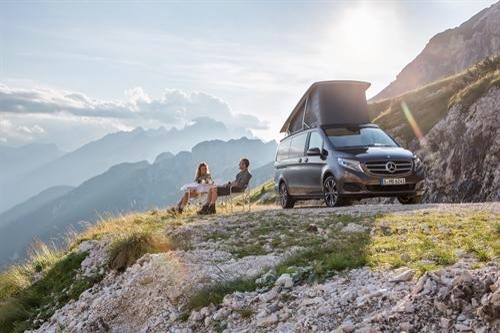 Mercedes-Benz is presenting a new star that stands for freedom and independence at the Düsseldorf Caravan Salon: the all-new Marco Polo ACTIVITY recreational vehicle. Featuring modern design, the ultimate in functionality and excellent sleeping comfort, it is equally ideal for long trips or daily and urban use. The compact Marco Polo ACTIVITY recreational vehicle boasts exceptional versatility. With a highly variable interior, comfortable berths for up to five people, five engine variants and three drive types, it can be customised to individual requirements. As such, it is the ideal vehicle the whole year round for young families as well as for sports and outdoor activity enthusiasts. The Marco Polo ACTIVITY combines leisure and daily use. The compact exterior dimensions, with a length of 5.14 metres and a width of 1.93 metres (excluding mirrors), combine with the electromechanical power steering to ensure great manoeuvrability and impressive agility. And with a height of 1.98 metres, it is able to enter all standard garages, multi-storey car parks, underground garages and car washes. 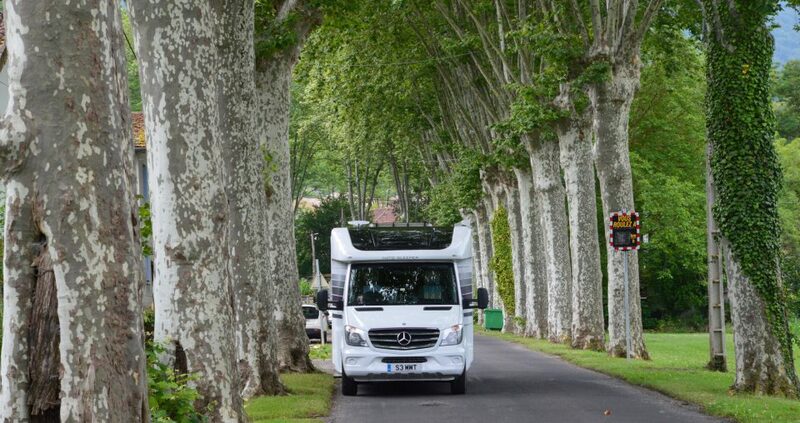 At the same time, the Marco Polo ACTIVITY offers a standard of dynamic performance, comfort and economy on a par with a Mercedes-Benz passenger car, allowing the utmost flexibility and spontaneity in daily and leisure use. 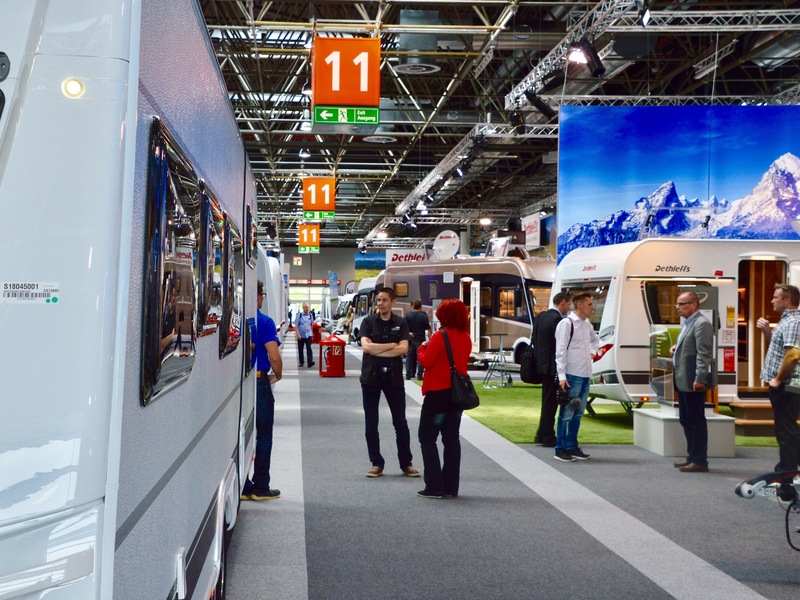 Wall to wall motorhomes at the Dusseldorf Caravan Salon. I would say two themes are clear. Firstly a lot of attention to new liquid habitation heating systems and winterisation. Secondly, a number of manufacturers seem to be installing sophisticated fold away bed systems above the driver and passenger seats in the shorter motorhomes – say below 6.50 metres and then using the now bedless space to create space and comfort. And then the same bed is left there in the longer models as a second bed with often the main bed now being an island bed. Both of these themes have been around for some time of course but walking through the vast halls at this enormous show they struck me as themes which, over time, were heading towards being the standard. Which is bad news for me as I cannot be doing with precision mountaineering just to get to bed!!!! I guess a third theme is the very positive and upbeat atmosphere which is nice to experience and is based on increasing sales levels in Germany and some other European markets. I tried to find people to be grumpy with but failed miserably.